Yes, more toile. It will become a recurring theme on this blog. 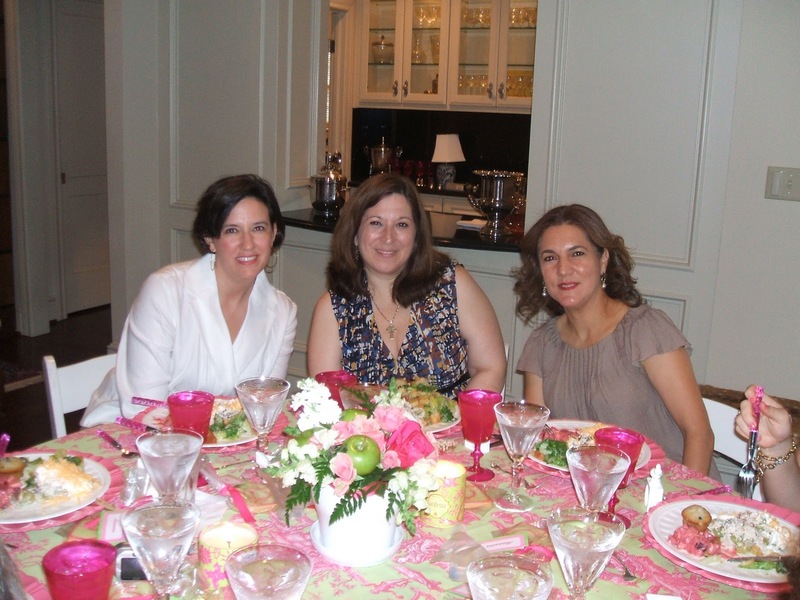 As we are going thru old photos to start up our blog, it's become evident how little my sister, Reba and I can resist toile. It is just so *pretty* and if you add in our DNA-based weakness for china (our mother absolutely NEVER cooks or entertains at home except for Christmas and New Year family meals yet owns 9 sets of formal china), then you will understand our multiple table settings & why they often include toile. Granny Smith apples in the centerpieces pick up on the green in the toile tablecloths. 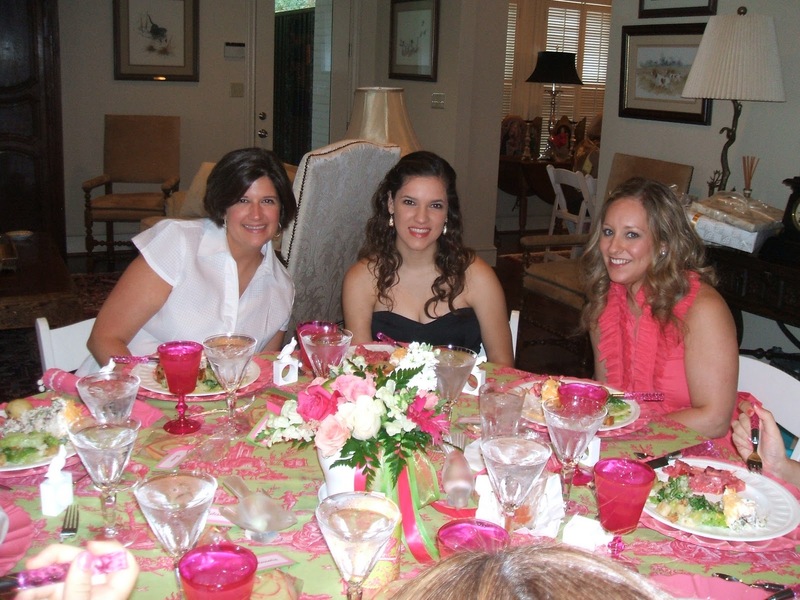 Guests enjoyed Ceasar Salad, Chicken Salad & a cranberry gelatin salad. 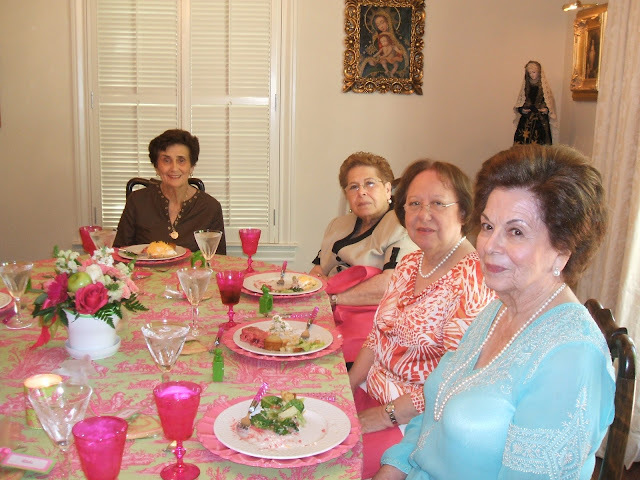 Reba's Mother-in-law of Marriage Saving Pound Cake Fame, our mother and their friends enjoy a luncheon in Reba's dining room. Notice how the cranberry salad and the Chicken Monique have disappeared off plates already? These recipes became Reba's luncheon staples because they are extremely popular with guests. 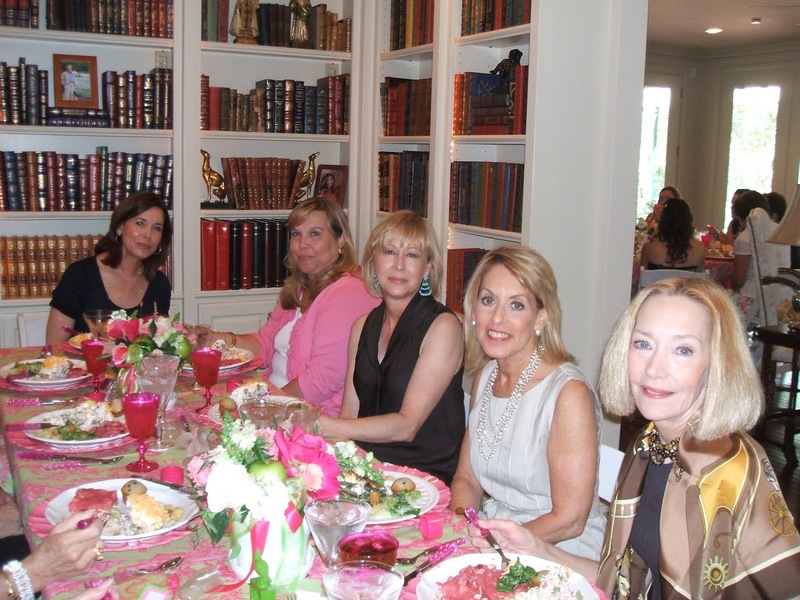 For this particular luncheon, Reba served the cranberry apple salad our family eats at Thanksgiving and Christmas to go with the pink color scheme. It is our grandmother's recipe and it has become one of our favorite foods. I am sharing the recipe here. FYI, after I posted this entry with our grandmother's recipe, there was some controversy with our mother over sharing our grandmother's recipe with the world. I am happy to say generosity won out and I was allowed to keep the recipe up so please take advantage of the recipe. Seriously, it is DELICIOUS! MELT cranberry sauce over medium heat. DRAIN, RESERVE liquid and SAVE berries. MIX together cranberry liquid, boiling water and gelatin. STIR until gelatin is dissolved. ADD lemon juice and salt. CHILL until mixture mounds slightly on a spoon. ADD mayonnaise, BEAT until smooth. FOLD in cranberry, apple and nuts. POUR into a 2 quart mold. CHILL overnight. Oh you really made my heart pitter patter with the pink and green combo....and add that it's toile and I'm over the moon! So glad that you shared that recipe -- this menu sounds wonderful and I love the idea of a chicken salad pie! I like the pink and green toile too. And please do try the recipes. They are very tasty. I don't think you will be disappointed. Thank you for visiting and leaving a comment. 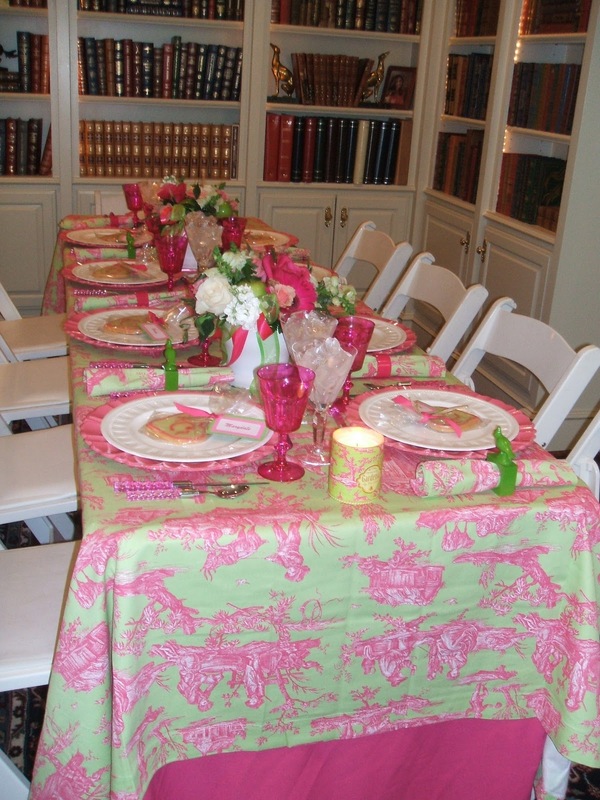 Love the pink and green combination and always adore toile. Thanks for sharing this lovely party. I love the pink and green combo too. So glad to meet another toile addict. My husband often makes fun of my toile addiction, but until we started this blog, I didn't realize Reba has the toile addiction just as bad as I do. Although I will say her dish situation might even be worse than mine. As long as it is organized, it isn't hoarding, right? LOL. Thank you for coming by and leaving a comment. It is appreciated! This is sooo pretty! Where on earth did she find the pink goblets? Love love love those! Great find on the tablecloth, definitely the star of the show!! Love your humorous writing style! It does sound like you come by your love of dishes naturally, given your mother's amazing collection! 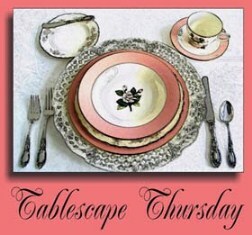 The pink and green tables are SO pretty -- and I love the colors echoed in the glassware. I also have a weakness for pretty invitations and often find myself thinking I should throw a party just so I can justify buying the invitations! 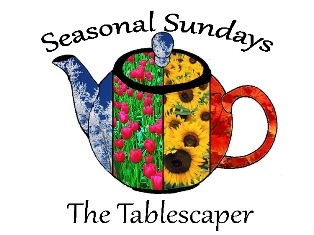 i really enjoy your commentary and the table is stunning! you make throwing a shower seem like a breeze!! i liked it so much i became a follower!! Hi there! 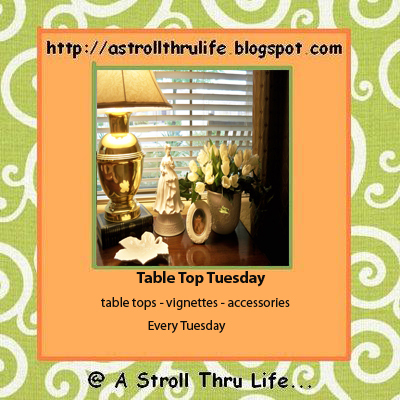 I think this is my first visit to your blog thru Tablescape Thursday. Lovely to see you here! I try to make sure that I visit each and every post each week, but I sometimes inadvertently skip one or two. If I'm guilty of that with you, I'm sorry. 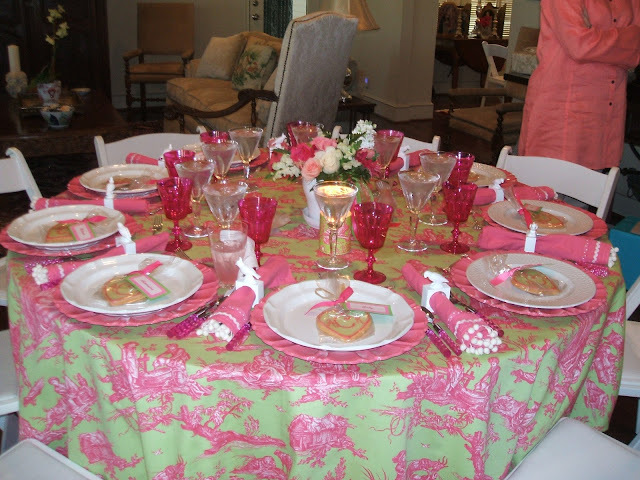 :-( I'm with Reba on this one...LOVE hot pink in toile or any other pattern!!! It's just such an energizing color! And the combination of green & pink together is a perennial favorite for me. The hot pink glasses in this post are so pretty! I have been looking for that color for ages...to no avail! If I ever see them, I will pounce on them and hang on for dear life!!! :-) Very pretty! Oh...and I LOVE the name of the "Marriage Saving Pound Cake"! Very cute!!! Have a great weekend!!!!! Thank you so much for visiting and leaving a comment. 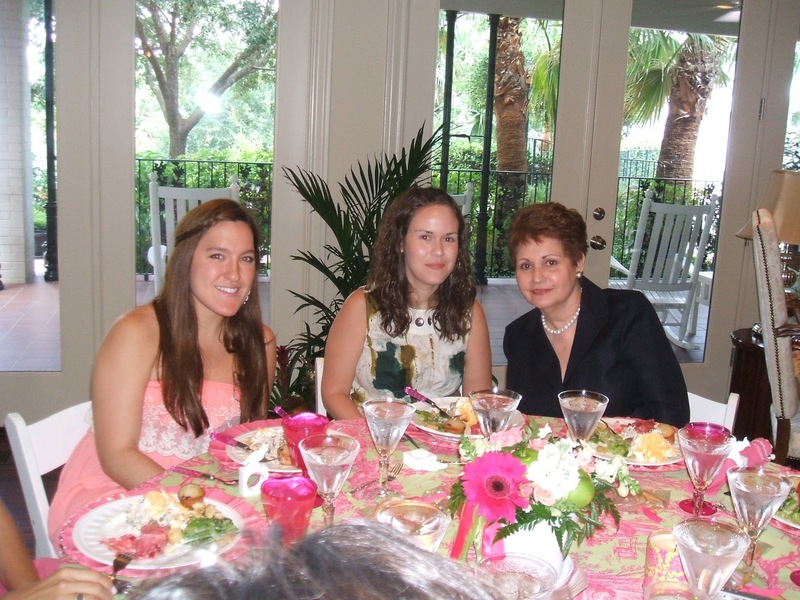 I don't know where Reba got the pink goblets, but I will let her know that people were asking about them. I will try to edit the entry when I find out the info on that. Thank you so much. I'm glad you liked my writing style. My mother cracks me up. She is the least domestic woman I know but she loves dishes. It's funny to me. And oh my goodness! I do the same thing with invitations. If I see a very pretty invitation, I am tempted to throw a party just so I can use the invitation. I'm so glad to know I am not alone. LOL! Thank you so much for visiting, leaving a comment and following. It is much appreciated. Throwing a shower can be so much easier once you don't try to reinvent the wheel each time and rely on some basics to make it more manageable. Thank you for visiting and leaving a comment. I'm glad you enjoyed the post. So glad that you dropped by and left a comment. I don't know where Reba got the hot pink goblets, but you're the second person to ask about them so I will definitely ask about them and post her reply. I just visited your blog and saw your collection of dishes and tableware. WOW! Just WOW! I am very motivated to try to organize my much smaller collection now. Thank you for hosting and for visiting and leaving a comment. 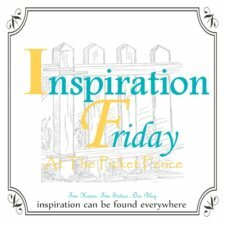 I just discovered your blog through Pintrest! Oh! My! the tablesettings are wonderful! That is exactly how I feel when I see beautiful vintage glassware and I want it all! Lucky for me and my pocketbook....I don't ever plan such big gatherings like you do.....30 WHEW! Anyway I love this and you can bet I will be back and will follow you on Pintrest!